SPONDIN is a boon for all those people who are fed up of consuming pills and applying lotions or gels and want long lasting solution for this problem. Apart from physical relief, this medication also works towards fighting off any permanent damage to the spinal cord and nerves. There are many reasons why one must use SPONDIN drops. First of all, there are no side effects, which means that it is extremely safe to use. The dosage is easy-to-manage and can be administered anywhere. Even pregnant or lactating women can have it. 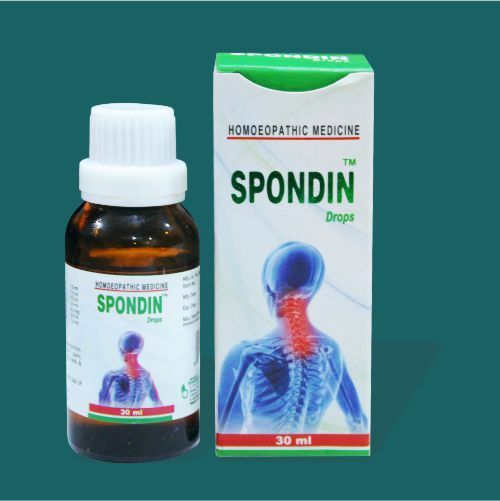 SPONDIN is also suitable for ambulatory patients. Most importantly, unlike other pills, there is absolutely no discomfort like acidity and heartburn. Prolonged hours spent on computers, in traffic, wrong posture while sleeping or working are a few reasons why the office going people, artisans, house wives and even students are at a higher risk of Spondylosis and spondylitis. The underlying reasons for spondylitis may need a change in the habits like posture but on the contrary, today's lifestyle does not allow an individual to rest much. And, NSAID s, Opioid analgesics, tricyclic antidepressants, steroids, pain relieving gels was all you could prescribe to your patients. What he needs is a break from the analgesics &amp; gels, which apart from possessing severe adverse effects are also inconvenient to carry, administer and apply at times. Doctor Bhargava SPONDIN drops is the right choice to relieve pain from spondylitis help you maintain your usual activities and prevent permanent injury to spinal cord and nerves. SPONDIN is an easy to administer, easily portable neck pain relieving drops to let you free in the movements. It eases the discomfort and stiffness arising due to spondylitis thereby allowing free movement of your arms, neck &amp; shoulders. Easily portable and easy to take. Children: half the adult dose or as directed by the physician. Side effects: None of the constituents of spondin drops have any side effects. Contraindications: Spondin drops is a natural medicine therefore can be safely taken with other medicines under guidance of physician. Symptoms : These days, Cervical Spondylitis may start showing symptoms from an early age of 26. Ruta graveolens: Relieves bone &amp; joint pain, strained muscles &amp; tendons, stinging pains, sharp back spasm associated with dogeurative changes as well accidental injuries acts well in deep pains &amp; broused feeling in neck &amp; back. Hypericum perforatum : Acts on nerve endings releasing their compression &amp; inflammation indicated in pain in nape of neck radiating to arms to fingers; pressure over sacrum; spinal concussion; coccyx injury from RIS with pain radiating up spine. Ledum palustre : Indicated in painful stiffness in back after sitting for long hours, aggravated by cold weather or cold water. Cuprum metallicum: Indicated in hyperaesthsia of spinal column; twitching of muscles of back up to the neck. Dulcamara : Indicated in stiff neck especially in damp weather; pain in small joints of the back; shooting contractions in the, shoulders and arms. Conium maculatum : Indicated in tension, stiffness &amp; pain in, the nape of the neck as from excoriation in the cervical vertebrae or sprains; dorsal pain between shoulders may or may not be associated with vertigo &amp; headache. Cervical Spondylitis is a common spine problem refers to inflammation of the vertebral joints pertaining to cervical area which primarily affects the axial skeleton, peripheral joint &amp; extra- articular structures. It may lead to cervical disc problem or nerve compression. Where I can buy spondin drops in Pakistan? There is no indication about the potencies of the composition!